It's one thing to say that America should be Christian. It's another thing to say it should be Christian like is was, like it used to be. When it actually was like it used to be, there were no stores open to sell the kerosene to burn Sam Hose because businesses were closed on Sundays. But a shop keeper was found to give kerosene to the crowd at no cost. When it actually was like it used to be, there was a Sunday in Georgia where Christians went to church in the morning and in the evening went to the public square to sell bits of Sam Hose's burned liver for 25 cents each. The brief association between the two men, captured in this picture, isn't really significant in that narrative in any way that's obvious. The government does have an interest in providing health insurance plans that cover birth control to women who want it. Some individuals who own corporations have the right to their religious objections to some (or all) forms of birth control. Therefore, the easiest way to provide birth control is not through employer-provided health insurance. Politically, there is plenty of fuel there for a number of fires. From another perspective, the Hobby Lobby ruling is pretty reasonable. Remaining unconvinced is not the same thing as being an atheist. Historian and theologian Vincent Gordon Harding died at 82. Harding founded Atlanta’s Mennonite House with his wife Rosemarie in 1961, a headquarters for consciences objectors and civil rights activists. He helped Martin Luther King, Jr. make the argument against Vietnam, drafting King's "Beyond Vietnam" speech in 1967, broadening the concern of the movement and alienating some moderate civil rights supporters. Author of numerous works on American-American religious history, including There Is a River: The Black Struggle for Freedom in America and Martin Luther King: An Inconvenient Hero, Harding taught at Illiff School of Theology in Denver, Colo. for more than 20 years. A Texas billionaire remembered mostly for his business exploits, Nelson Bunker Hunt bankrolled the religious right. He underwrote many Campus Crusade’s projects, including the 1967 "Berkley Blitz," the $6 million Jesus film in 1979, and a $30 million campaign to evangelize the world by 1980. He gave $1 million to help start the Moral Majority and financed the founding of Tim LaHaye’s Council for National Policy in 1981. Hunt also tried to buy all the world's silver as a hedge against the financial collapse he believed the Bible predicted. He lost $1.7 billion and went bankrupt in 1989. He died at 88. In TV and radio appearances he's frequently called on to discuss an old subject: How does he reconcile his faith with science? So why do so many feel the two do -- or should -- conflict? Consolmango tells Tabor it's caused by a seeing both science and religion as smaller than they really are. In the same way, he argues, science doesn't begin with logic. It begins with insight, and it uses logic to 'support the intuition after the leap of insight has occurred' -- or to scrutinize insights and discard or refine them. In a final scene of the 1946 Christmas classic It's a Wonderful Life, George Bailey opens a Christmas present from his guardian angel. It's a copy of Tom Sawyer with the inscription, "Dear George, remember no man is a failure who has friends." What are the politics of that sentiment? Two friends debate the political leanings of It's a Wonderful Life at the group blog Mere Orthodoxy. Chris Schaefer argues that the movie is not as conservative as conservatives think it is. The movie is liberal-ish in its critique of capitalism and in its New Deal-era values, even if it's not explicitly politically left. In the movie, for example, being moral means being bad at business. George improves the lives of his customers AND that he has a successful business full of entrepreneurial spirit. Is that really what is happening? As far as we know, his for-profit company never makes a profit, and his community spirit interferes with his entrepreneurial spirit at every turn. Think of his comment to the bank-examiner that 'between us, we're broke' or when the real estate agent points out to Potter that the Baileys 'don't make a dime' off of the houses they build. The Bailey Building and Loan isn't a successful business full of entrepreneurial vim; it's a community service center subsidizing people trying to live above their means. One of the things that has not been smart has been to lump evangelicals and fundamentalists in with the conservative Christian Right. While a lot of people have been confused on things and connect with the Christian Right on stuff, to lump this huge group of people or write them off as not part of our [workers' rights] movement is dumb. You see that right now on immigration reform. The evangelical world is completely solid on immigration reform. And at the local level, we see a lot of fundamentalists and evangelicals involved in the work. We need to understand there are some very well-funded, concerted efforts by right-wing forces to continue to capture [evangelicals]. The Heritage Foundation published a small study guide entitled 'Seek Social Justice.' It argues that the best way to help poor people is to do it through your church, because we are closer to people, and thus the best way to get there is to cut taxes of rich people and give more money to the church. 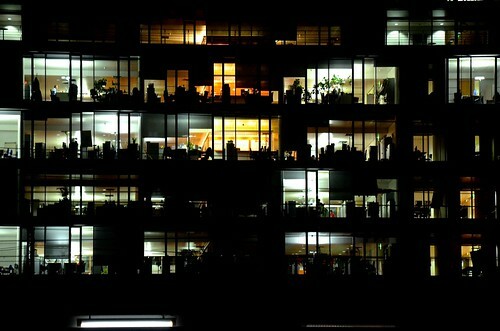 It also makes these wild statements like, 'If people aren't happy with their jobs, they can just go find another one.' Really? It is not a very sophisticated argument. We should not assume [evangelical Christians] are a static group of people that is owned by the Right Wing. This is a set of folks that have a set of values of their faith that are being contested. I think that we need to be in there contesting for them. It's hard because the Right Wing understands the importance of the faith community in these issues. They put a lot of money into funding right-wing religious organizations; the progressive world doesn't. It's not exactly what Bobo is talking about, but it's worth noting that even while the Religious Right has maintained its electoral strength -- about a quarter of voters were white evangelicals last election and nearly 80 percent voted Republican -- the minority of evangelicals on the political left has persisted too. Hauerwas speaks more on the church, and how it's not a "secondary reality," here. Published in a Moody Bible Institute magazine in Dec. 1925. Some people don't get it. 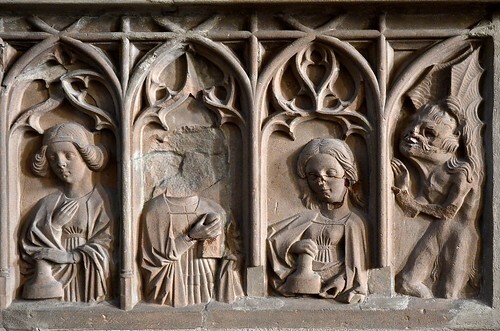 But for those who do, the religious experience of it all is palpable. Some blend of harmonics and melodics, tradition and improv, mastery and experimentation, makes A Love Supreme one of the great religious movements in modern life. Recorded in a four-hour session on December 9, 1964, with Coltrane on alto saxophone, Jimmy Garrison on bass, McCoy Tyner on piano, and Elvin Jones on drums, the music does not discriminate, inspiring the secular and the spiritual alike. ... What is it about Coltrane, and in particular A Love Supreme, that gets some of us going spiritually? Coltrane was after truth, as one biographer put it, and not necessarily “pleasant listening.” I am attracted to this idea, that truth is difficult and can not easily be possessed. The corollary here is that there is no truth in Musak, and not much in the pop charts. In classical terms “truth” and “beauty” are not interchangeable. Perhaps more importantly, truth is heard. In a recent interview, Cornel West called Coltrane "a spiritual giant. He's a love warrior. He's a titan of the soul." West connected the art of A Love Supreme with the theological idea of kenosis, a Greek word the Apostle Paul used to describe how Jesus "made himself nothing." West said that's what Coltrane did too. He mastered the craft. His technique is beyond description. But he's always speaking from who he is, his kenosis. He empties himself. He gives himself. He uses the gifts that he's honed to try to enable and empower others. And in Love Supreme it all comes together . . . His capacious imagination and his all-embracing sense of experimentation allowed him to listen to sounds everywhere . . . If you really look at the deep expression of humanity in it, Coltrane is a culminating moment. The anniversary of the album is being celebrated around the country, including in a service at the St. John Coltrane African Orthodox Church in San Francisco, this Sunday. A Thomas Kinkade sculpture valued at $7,500 has been stolen from an Indiana gallery. 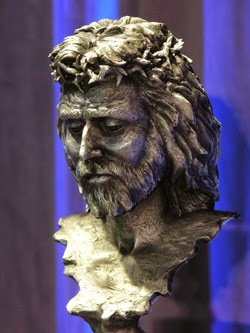 The bronze head of Christ, one of a limited edition of 30, was stolen from the Thomas Kinkade store in Zionville, Indiana. The owner of the store says it was probably taken during the rush of shoppers on Small Business Saturday, on Thanksgiving Weekend. There is also a parade in Zionville that day, and the store was busy. The sculpture is over 11 inches tall and weighs about 20 pounds. The theft wasn't noted until the next week, according to the Indy Star. "I walked in the room where the sculpture was, and there's an empty space," Rhonda Crawshaw, gallery manager, was quoted as saying. tilt of the head "seems to link him to heaven and earth." Kinkade, an evangelical painter who trademarked himself "the Painter of Light," was beloved by fans and reviled by critics, who dismissed his work as kitsch. Kinkade promoted his work through retail outlets, bypassing the art world and its tastemakers and selling directly to middle America. The approach was profitable. At one point, the Kinkade Media Group was selling work at 4,500 outlets and earning $128 million per year. He told the Guardian that, despite being written off by critics, "My art is relevant because it's relevant to 10 million people. That makes me the most relevant artist in this culture." He told the New York Times, "People who put my paintings on their walls are putting their values on their walls: faith, family, home, a simpler way of living, the beauty of nature, quiet, tranquillity, peace, joy, hope." At the same time, New York Magazine critic Jerry Saltz used Kinkade as proof that art should not be judged democratically or by the market. "It isn't about the biggest market share," Saltz said. 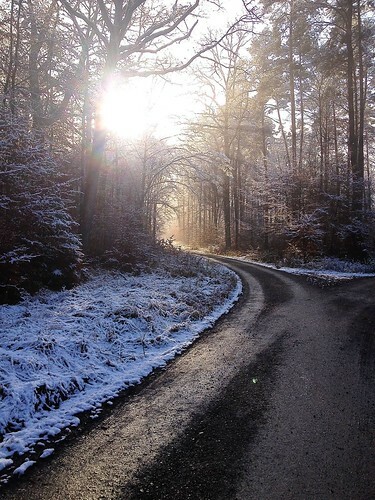 "If that were true then Thomas Kinkade would be the greatest artist who ever lived." Financial didn't bring Kinkade professional respect. It did bring other problems. He was sued over his business practices, and lost one high-profile suit in 2006, which reportedly cost him $2.8 million. When he died in 2012 at the age of 54 from acute intoxication from alcohol and valium, his wife and girlfriend battled over the more than $60-million estate he left behind. It also brought thieves: a month after Kinkade died, 40 Kinkade paintings worth an estimated $300,000 were stolen from an art dealer in Clovis, Calif. Police named a suspect in the case, and the man was arrested later that year, but the paintings do not appear to have been recovered. In the Zionville, Ind., case police don't have any suspects. The best chance of recovering the stolen property might ultimately be Kinkade art dealers. The $7,500 art piece, titled "Prince of Peace," in marked No. 8 in the limited edition series. 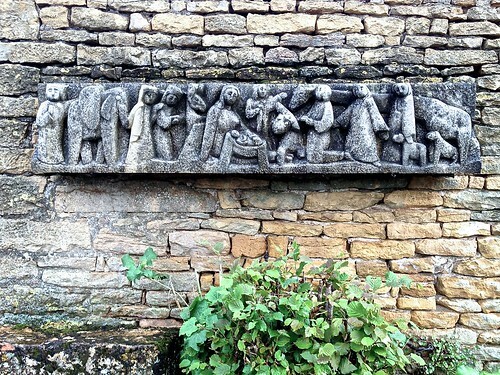 Baby Jesus thieves literally take the Christ out of Christmas. When they do, it becomes apparent that the sacred object is also a piece of property, protected by the law that protects property and this whole apparatus that defends Christmas: fences and lights, tracking devices and private security companies, patrolling police and the courts. The commercialization of Christmas is visible here in a way it might not be, otherwise. That's the power of the joke. Stealing the baby Jesus can seen as a protest against the commercialization of Christmas, which is to say against Christmas, since the theft, as a theft, shows how indistinguishable the commercial and religious aspects of this American holiday really are. Read the rest of the essay, Thieves Taking the Christ out of Christmas. Literally., at Religion Dispatches. These people affirmed, in one form or another, that the Bible is God's word. A majority, 51 percent of the entire sample, picked one of the top two options. But only 21 percent agreed that everything in the Bible is literally true. Thirty percent chose the second statement: that the Bible is 'without errors' but that 'some parts are meant to be symbolic.' This isn't what secular people tend to think inerrancy means. But it is what a lot of Christians apparently believe. Part of the issue, here, is the difference between official dogma and what lay people believe. As a LifeWay Research poll recently found, evangelical Christians do not always adhere to the orthodoxy that their churches teach. About 20 percent say God the Father is more divine than Jesus and more than half say the Holy Ghost is not a personal being, neither of which are ideas acceptable to Trinitarian churches, which would include all evangelical ones. Evangelicals "in the pews" (so to speak, since they're not normally in pews) don't always have as strict an interpretation of biblical literalism as their conservative churches' officially teach or even as strict as one might hear "from the pulpit" (so to speak, since many evangelical churches don't actually have pulpits). But that's only a small part of the issue. Even the most official and most dogmatic statement of biblical literalism allows for symbolism. The Chicago Statement, for example, is a landmark statement of official conservative evangelical belief in biblical inerrancy, but it doesn't describe it like that. Article XVIII, for instance, says, "WE AFFIRM that the text of Scripture is to be interpreted by grammatico-historical exegesis, taking account of its literary forms and devices, and that Scripture is to interpret Scripture." This means, specifically, that everything isn't to be taken literally. Historical statements are to be taken as empirical statements of fact, but there's a lot of poetry in the Bible too, and that can be read differently. It's completely possible to believe that the first two chapters of Genesis are inerrant and to think they're not scientific or historical descriptions of what happened. To quote Saletan again, "This isn't what secular people tend to think inerrancy means." But whose fault is that? The phrase "literalism" itself is partly to blame. It is misleading. No biblical literalist, reading that Jesus said "I am the door," was ever confused about whether or not that was a metaphor. That just isn't what "literalism" means. It'd be worthwhile to stop using the word. "Inerrant" is better, though that has separate issues that have to be dealt with. As long as "literalism" is used, though, it will be necessary to insist and insist repeatedly that "literalism" shouldn't be understood too literally. Traditionally, people have believed that this expectation that Jesus is coming back would lead to indifference, that people would focus on the next world, they would invest very little in this world. In fact, they’ve done just the opposite. This is a central argument in the book. D.L. Moody is often used to illustrate the idea of indifference. He famously said that the world is a sinking ship and God has given him a lifeboat and told him to save as many as he could. That’s the idea, that there’s not anything you can do but save those who are sinking. 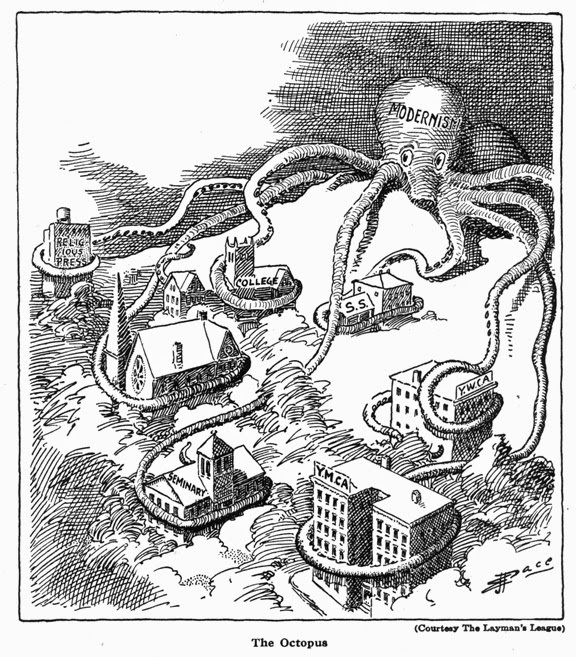 At the same time, Moody turned around and established what were later known at the Moody Church and the Moody Bible Institute, which were extremely active in reform movements during the progressive era. They were focused on issues of crime in Chicago, sanitation, temperance, and in all kinds of moral reform efforts. It's clear from Moody to Billy Sunday to Aimee Semple McPherson to Billy Graham to Jerry Falwell, that to believe that Jesus is coming at any moment does not make you less active or less involved in your culture. They say over and over and over again that this is not the case. We just haven’t heard them. Every generation of evangelicals and fundamentalists says it. Their apocalyptic theology makes them more active not less. Read my full interview with Sutton at Religion Dispatches: "It's the Apocalypse, Stupid: Understanding Christian Opposition to Obamacare, Civil Rights, New Deal and More." 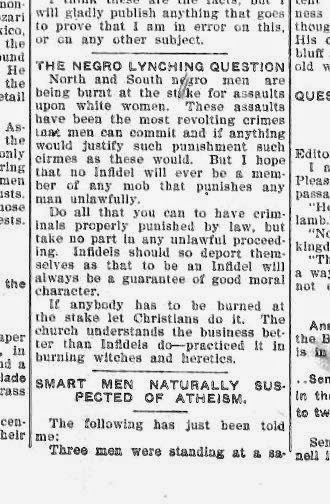 Atheists shouldn't be involved in lynching, according to this July 1903 editorial note from Charles Chilton Moore's atheist newspaper, the Blue Grass Blade. A Kentucky native, Moore was opposed to the extra-legal aspect of lynching, not lynching per se. This was a fairly common moderate position at the time. He does not appear to have been bothered by the racial aspect of lynching or the legitimacy of the allegations and their dependance on racist tropes, but instead by the fact this "justice" was outside the law. When he wrote about lynching, though, it was less to condemn the practice than it was to attack Christianity. At the time, between 50 and 100 people were being lynched every year.